Find the GMA News Report here. 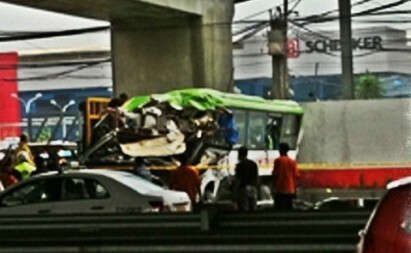 Apparently, strong winds reportedly caused the bus to fall. This is possible. I have passed Skyway a number of times and I noticed that even when driving a sub-compact sedan, you will feel the wind pushing your vehicle especially in the Sucat area (high level). In other countries like Korea they use wind barriers that protect your vehicle from flipping due to strong winds. This is very alarming. 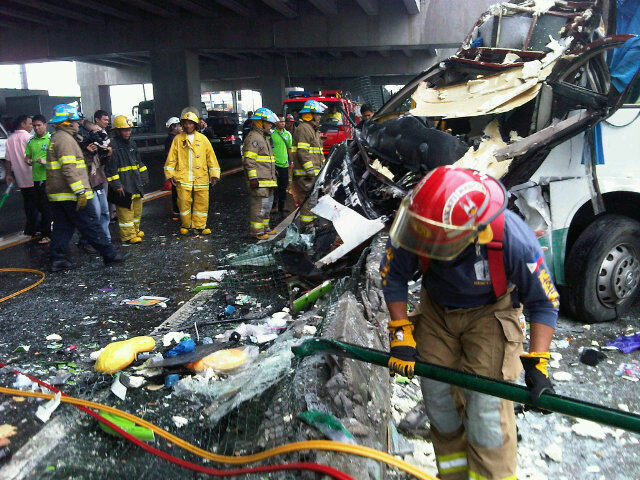 Hopefully Skyway authorities do something about this so that this will not happen again. Not our photos. Don’t know who to credit for them but will post as soon as we find out. Thanks. Since it was very wet and windy, the driver should have exercised caution while driving along the skyway. The bus only has seven passengers, thus making the load of the bus very light. Moreover, looks like the threads of the front tires were already thin, which may have caused the bus to aquaplane and lose control. This may explain the feeling of strong wind causing the bus to suddenly veer to the right. They should check the cctv video of the bus, if it was moving fast. The most logical explanation to this from scientific POV is HYDROPLANING where the bus was already cruising at 7.7 times the square root of the tire pressure where REVERTED RUBBER condition was achieved. At the onset of hydroplaning caused by the relatively thick layer of water due to heavy rains and the bus travelling at relatively high speed, the driver noticed uncontrollable steering while braking. 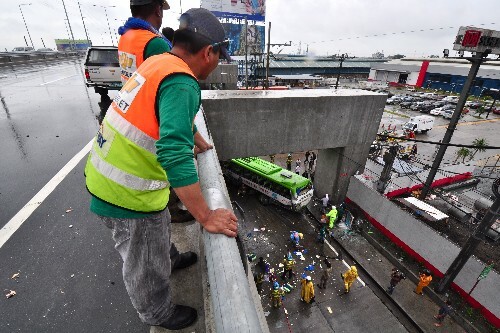 Tendency is to apply more heavy braking, then the wheels (tires) locked and the water developed into a steam, reverting the tire to uncured state and hence more uncontrollable steering sending the bus to the Skyway gutter, broke it and went 30 feet down . Evidence!? See the tire rim without the rubber! Lesson: slow down on wet road. do not go beyond the speed equal to 7.7 to 9 times the square root of your tire pressure in order not to go to HYDROPLANING or AQUAPLANING state. If your tire pressure is 32 PSI, limit your speed at or below 80MPH. Wow. Thanks for this very scientific explanation.